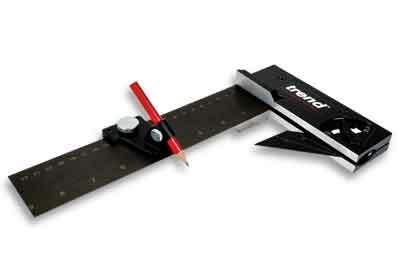 This new and improved 3D combination try square from Trend now includes low-profile wing for easier bench work. It also now has an etched scale on the blade in both imperial and metric measurements and includes angle indication on the bevel gauge blade. There is an integral bevel gauge locking lever and the resettable 225mm Sheffield sprung steel main blade is 50mm wide. This 3D square outperforms traditional try squares as it just has to be moved once when marking round all four sides of a component, thus saving time and reducing the margin for error. The reduced-height wing allows for easier bench working on material over 16mm thick and is factory set to within a tolerance of 1/100th of 1°.